“A collaboration originally brewed with Lervig for the Independent Manchester Beer Convention aka Indy Man. The beer is easy-drinking, straw coloured with slight tartness from the gooseberry, complimented with loads of Citra and Nelson Sauvin hops that play perfectly with the fruit. We then added Centennial, because who doesn’t like Centennial? But where did the name come from? Well, when one of our team heard we were brewing a gooseberry beer he got all excited exclaiming he had a gooseberry tree in his garden and we should use some of the fruit from that. 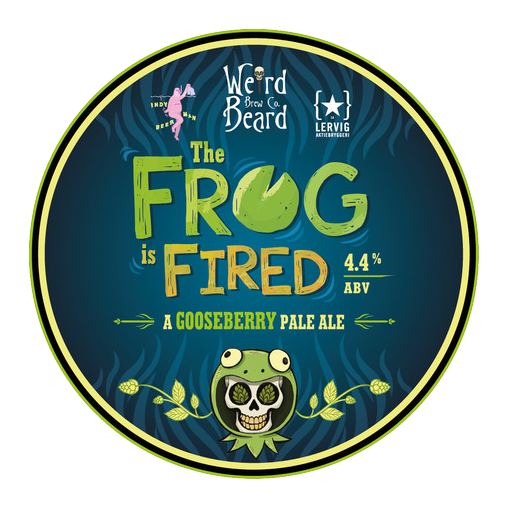 A few days later we were informed that that there was just a single gooseberry on the tree, but we thought ‘what the hell, we’ll throw it in the boil anyway.‘ The night before the brew, I sent a reminder to bring our sacred gooseberry in, but got the below email entitled ‘The Frog Is Fired’.